2019 Mercedes Benz GLS Class Trim Levels with Comparisons & Configurations. What 2019 Mercedes Benz GLS Class Trim Level Should you Buy? What is the Difference Between Trims? What comes to mind when you hear the name Mercedes Benz? Power? Comfort? Safety? Luxury? Well, all of the above apply when describing the 2019 Mercedes Benz GLS Class. This line-up of SUVs is getting rave reviews, praising its extremely quiet and luxurious cabin, incredibly spacious third-row of seating, and the powerful powertrain options that provide excellent acceleration and smooth transitions. The only thing some buyers might be deterred by is the price. There is a pretty big leap from the base GLS 450 to the 550 4MATIC. Also, some of the features that you would expect to find as standard on a luxury vehicle are either optional or non-existent. It makes us scratch our heads and wonder why Mercedes Benz would leave certain features out. Still, it does little to take away from the vehicle's stellar performance and stunning looks. The hardest part about buying the GLS Class is figuring out which of the three trim levels to buy. The GLS 450 is definitely the most affordable, but the 550 4MATIC gives you standard all-wheel drive. And the line-topping AMG GLS 63 is, of course, the most decked out in features. So, which of the GLS Class's three trim levels will best suit your needs? Which ones should you skip over? Read on through to the end of this comparison review, and, by then, you should have a clearer perspective on which 2019 Mercedes Benz GLS Class trim level is the right one for you. Compare the 2019 Mercedes Benz GLS Class 450 4MATIC vs 550 4MATIC Trim Levels. What is the difference? The 2019 Merecedes Benz GLS Class has a base trim known as the 450 4MATIC. This trim level receives its power from 3.0-L V6 bi-turbo engine that produces 362 hp and 369 lb-ft of torque. Paired up with a 9G-TRONIC 9-speed transmission, the 450 4MATIC is able to get up to speed from 0 to 60 mph in roughly 6.5 seconds. A 26.4 gallon fuel tank accompanies the vehicle. As the name 4MATIC indicates, all-wheel drive is standard. This large SUV is rated for towing up to 7,500 pounds. It rides atop 19-inch five-spoke wheels and comes with all-season tires equipped. You can opt for an adaptive damping system, an active curve system, an enhanced off-road driving program, front underride protection, and a Class IV trailer hitch. On the outside, you get standard aluminum roof rails, dual chrome exhaust tips, and the ultra cool-looking side-mirror projectors that project the Mercedes Benz Logo as a way of welcoming you to your vehicle. The GLS 450 4MATIC also has privacy glass on the second- and third-row windows and on the liftgate. You can choose between nine different - and equally stunning - body paint colors. If you want, you can add Grand Edition detailing in the Grand Edition Package, 19-inch twin five-spoke wheels, or 20-inch 10-spoke wheels (with or without black accents). The Appearance Package includes the 20-inch wheels and illuminated running boards. Throughout the cabin, you will find a lot of luxurious features and, to be sure, plenty of comfort. The interior comes standard with gorgeous hand-fitted leather upholstery, hand-finished wood trim, and metallic accents. A 7-inch touchscreen display sits front and center upon the stack and provides crystal-clear graphics. The multi-functional steering wheel is clad in Nappa leather, and there is premium lighting that illuminates the cabin when it gets dark out. You can opt for a wood-and-leather combination steering wheel, multi-color ambient lighting, front door sills that are lit up, several different types of wood trim, and Black Piano Lacquer and aluminum trim. Both front seats receive standard heating, and the driver's seat is 10-way power adjustable with memory settings. There is also four-way power lumbar support built in to the front seats. 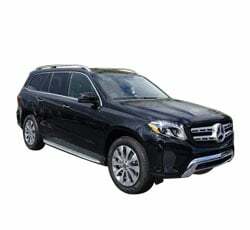 Other standard luxury features slapped onto the GLS 450 4MATIC include remote start, Mercedes me connect Assist Services, easy entry for the second row of 60/40 split folding seats, a power tilt-and-telescoping steering column, a brake HOLD feature, a universal garage door opener, and the ability to open and close windows via an infrared remote. You can also opt to include a heated steering wheel, KEYLESS-GO, front cup-holders that are both heated and cooled, sunshades for the second row of windows, a panoramic sunroof, full-grain leather upholstery, ventilated front seats, heated second-row seats, and a massaging feature on upgraded multi-contoured front seats. Aside from the touchscreen, there are quite a few stand-out multimedia features to be found inside of the GLS 450 4MATIC. For example, this trim level comes standard with Bluetooth connectivity, Garmin MAP PILOT, two USB ports, a central controller, and HD radio. There are quite a few additional options as well. These include smartphone app integration via Android Auto and Apple CarPlay, a rear seat entertainment system, COMAND with navigation or with a touch-pad controller, voice control, in-vehicle WiFi connectivity, and an in-dash CD/DVD player. Of course, plenty of safety features also come equipped on the GLS 450 4MATIC. The long list of features includes a rearview camera, active brake assist, an emergency call function, adaptive brakes, SmartKey with KEYLESS-START, and driver-side and rearview mirrors that are automatically dimming. If this isn't enough for you, you can choose to add active LED headlights, a blind spot monitoring system, active parking assist, a surround view camera system, and adaptive high beam assist. For about $25,000 extra, you can upgrade to the GLS 550 4MATIC. This trim level is powered by a 4.7-Lbi-turbo V8 engine that is perfectly capable of generating a massive 449 hp and 516 lb-ft of torque. Like the GLS 450 4MATIC, the 550 4MATIC has an all-wheel drive drivetrain and a 9G-TRONIC 9-speed automatic transmission. With such a powerful mechanical set-up, the 550 4MATIC can easily get from 0 to 60 mph in just 5.2 seconds. Also, it rides atop bigger, 21-inch AMG twin five-spoke wheels. On the outside, the two trim levels will look a bit similar. The 550 4MATIC can be equipped with any of the same body paint colors as the 450 4MATIC. However, it has special AMG Line body styling that sets it apart. The illuminated running boards are made standard. Options are available for adding black accents to the wheels and giving the vehicle the Grand Edition detailing treatment. On the inside, the GLS 550 4MATIC also steps it up a notch in terms of luxury. The passenger seat gains memory functions, and both front seats have standard ventilation. Upgraded leather is also swapped in, and there is a 115v/150w power outlet. Optional features include an air purification system for the cabin, topstitched Nappa leather trim for the dash, and three different choices of designo Nappa leather. The infotainment set-up gets a few big upgrades as well. An 8-inch touchscreen graces the center stack, and COMAND with a touch pad controller and navigation come equipped on the 550 4MATIC. Other standard features include voice control, a 6-month all-access trial subscription to SiriusXM Satellite Radio, smartphone app integration, and an upgraded Harman Kardon LOGIC7 sound system. Additionally, you can choose to equip WiFi, TuneIn Radio, the rear seat entertainment system, and a 14-speaker Bang & Olufsen BeoSound Premium sound system. The 550 4MATIC adds quite a few more standard safety features as well. These features include active LED headlights, blind spot monitoring, a crosswind alert, the surround view system, an advanced tire pressure monitoring system, and rain-sensing windshield wipers. active steering assist, active blind spot assist, and active lane keep assist remain optional. Compare the 2019 GLS Class 550 4MATIC vs AMG GLS 63 Trims. What is the difference? Of course, if you want the creme de la creme of this line-up, you will have to spend upward of $126,000 on the line-topping AMG GLS 63 trim level. So, what exactly makes this trim worth its hefty price tag? Well, the mechanical features certainly get upgraded. The AMG GLS 63 is powered by a 5.5-L AMG bi-turbo V8 engine that gets a whopping 577 hp and 561 lb-ft of torque. The AMG Speedshift Plus 7G-TRONIC transmission comes standard, and this helps the vehicle achieve the mind-blowing 0-to-60 mph speed of just 4.5 seconds. To top it all off, the AMG GLS 63 rides on 21-inch AMG twin seven-spoke wheels with high performance tires slapped on. The exterior does look strikingly different as well. There are four chrome tailpipes in the rear that are specifically AMG-designed. If you want, you can choose to go dark with the Night Package's jet black hue. You can also choose to get red-painted brake calipers or upgrade to one of three different wheels (21-inch AMG cross-spoke in matte black, 21-inch AMG multi-spoke with black accents, or 22-inch AMG multi-spoke in matte black). On the inside, you will find uniquely AMG design elements as well. Just look at the instrument panel with its AMG performance readouts and AMG DYNAMIC SELECT control. There is even a race-timer function for recording laps! The multi-color ambient lighting comes standard, as does an AMG Nappa leather performance steering wheel. Also, the panormanic sunroof gets standardized, and an exclusive DINAMICA headliner offsets the exclusive and chic Nappa leather upholstery. If you are feeling extra fancy, you can choose to equip power easy entry on the second row of seats. With regard to infotainment technology, it remains mostly similar to what you find on the 550 4MATIC. And as far as safety features go, absolutely everything comes standard. The 2019 Mercedes Benz GLS Class is a luxury SUV that heavily emphasizes performance. The biggest issue that some consumers will likely have is feeling a tad overwhelmed by the enormous price jump between each of the trim levels. That is why our pick for the best deal in this line-up is the base GLS 450 4MATIC. It has enough standard features, plenty of optional ones, and is the most affordable. While the engine might not provide as much excitement as the beast that's equipped on the AMG GLS 63, it is still a capable piece of machinery.